Hospitality Industry - What can Sage Live do for you? 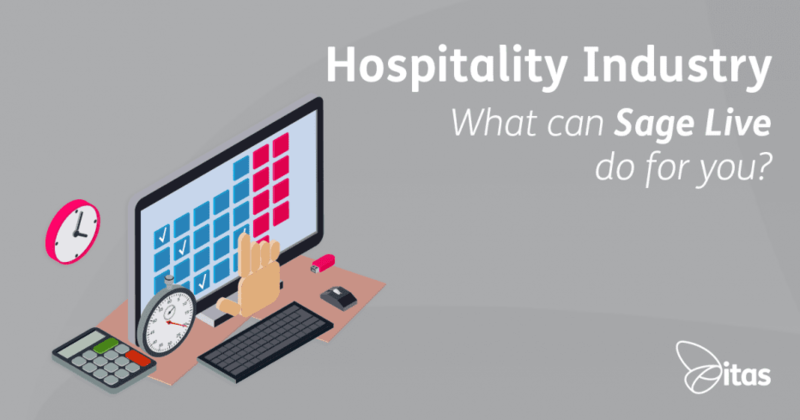 Hospitality Industry – What can Sage Live do for you? In this blog series, we will be taking an in depth look at what value Sage Live can bring to your business. In today’s blog (part 2) we will be looking into the world of Hospitality and how Sage Live can help push your business forward. Sage Live is a web based, mobile ready, integrated cloud accounting solution. Built on the Salesforce platform, Sage Live is the next generation of Accounting. The system provides you with real time data, so that you can keep track of whats going on in your business as it happens. As Sage Live is built on the Salesforce platform, it can also be integrated with 1000’s of Salesforce Apps. Therefore, your accounting solution becomes part of your business management solution. The idea behind this, is that it breaks down barriers in your business allowing visibility and collaboration across your organisation. To find out more about the hype around Sage Live, check out our blog. Sage Live is perfect for the Hospitality sector for many reasons. Such as the integration between EPOS Now and Sage Live, means that any transactions put into the till using the EPOS Now platform, will automatically push straight through into Sage. Consequently, time that would have been spent on entering transactions can now be used on more productive tasks. One of the great things about Sage Live is the automation of non-value added tasks. The system integrations mean you are able to re-evaluate your resources within the business and maximise the potential of your employees. Another great feature of Sage Live is the ability to ‘Tag’ pretty much anything you like to a transaction. As a result, Sage Live gives you as much granular reporting as you like! You can tag transactions by event, stay time, period, store, room type, customer, sales rep. If you there is something you want to be able to track and measure, Sage Live allows you to do so. The freedom of this tagging system means that the power of reporting in Sage Live is huge. You can read more about Dimensions & Tags in our blog. The mobile application of Sage Live, means that figures can be checked remotely and expenses put in on the road. Due to the fact that Sales Live is built on Salesforce, almost any Salesforce App can integrated with Sage Live. This also includes a Shift Scheduling app, allowing you to manage your staff, equipment, rooms and other resources. And of course, you can integrate with Outlook and other standard Salesforce Apps. Sage Live is a web based program so there is no need to purchase servers, or to go through installations. The pricing for Sage Live has been set up to cater for all sizes and types of businesses. Ideal for start-up companies or even an established company with 200+ employees, there is a plan for all. Pricing has been put into 3 different options: Essentials, Standard and Premium. Click here to find out more pricing information or to enquire now. Home » Sage Blog » All Sage Blog Posts » Hospitality Industry – What can Sage Live do for you?